Who does not know papaya? Fruit with a sweet taste with a reddish orange soft texture of meat and fresh fruit is not easy to make people forget about it. The price is economical and affordable by all walks of life and is easy to obtain that the fruit makes the Java call with the name “papaya” as one of the favorite fruits of interest families. Very tasty consumed especially in the cold, especially when dipped in salad seasoning spicy and seductive, hmmm who does not drool made? Before we investigated the efficacy and benefits of papaya fruit for health, do you know that papaya is actually have a nickname? Papaya fruit is created which earned the nickname as the “Fruit of Longevity” while Christopher Columbus did in the past referred to him as “fruit of the Angels”. Wow, that sounds great nickname for fruit size populist and often underestimated not? But the nickname is actually very precise and very reasonable. Because the papaya has a variety of benefits contained therein. Papaya contains antioxidants that are beneficial in the fight against degenerative diseases. Amazingly, this fruit can be consumed ranging from infants to the elderly group because the texture is relatively soft when it has matured. Papaya (Carica papaya L.) is a fruit belonging formerly exotic and rare, but now is a fruit that is very easy to find and are often sold in the market. Initially, the fruit came from Mexico, then continues to grow until much cultivated in Indonesia. Papaya plant plants belonging adaptive and able to grow in the lowlands and highlands. Not infrequently, this fruit can be found as a plant in the garden or in the yard as a house plant. Papaya fruit is a natural source of vitamins and minerals that are important to normalize body functions. Papaya can be eaten as a fruit that is ripe, prepared vegetables, eaten as a salad, candied, in juice, or can be used as a face mask. So what exactly is the efficacy and benefits of papaya fruit for health? The health benefits that can be obtained from consuming papaya fruit of which is a reduced risk of heart disease, stroke, cancer, aids in digestion, improve blood glucose control in people with diabetes, lower blood pressure, improve wound healing, sharpen eyesight, fight aging and very good for health skin. Papaya fruit is a fruit that is rich in antioxidants. Vitamin A and its derivatives (β-carotene, β cryptoxantin-, and lutein-zeaxanthin), including antioxidants that can prevent the oxidation by free radicals. That is, by eating papaya can help prevent degenerative diseases such as cancer, heart disease, and stroke. A combination of vitamin A, vitamin C, and vitamin E in papaya may prevent the oxidation of cholesterol. This cholesterol can attach to and accumulate in the walls of blood vessels and forming dangerous plaques (atherosclerosis). If left unchecked, can lead to heart disease and stroke. Benefits of papaya fruit which is quite important for the health that is able to increase the body’s immunity. Papaya is a fruit source of vitamin C which is very good. The content of vitamin C in papaya is higher than the content of vitamin C in sweet orange. Based on data from the USDA Nutrient Database, in 100 grams of papaya contained as much as 60.9 mg of vitamin C that can meet 100% of vitamin C in the body. A preclinical testing carried out by Nayak et al and published in Indian Journal of Experimental Biology (2007) examined the role of papaya fruit extract on the improvement of the condition of the wound. As a result, papaya extract can help accelerate the wound healing process. This is presumably because the vitamin C in papaya extract that can increase the formation of collagen in scar tissue and prevent additional infections by microbes. In addition to vitamin C, the content of papain in papaya fruit extract is also believed to give effect wound healing. Vitamin C acts as anti-free radical, anti-inflammatory, and enhancing the body inunitas system. Papaya is a source of vitamin B complex which helps the body work. Folic acid merpakan one vitamin B complex that plays an important role on the function of the body. Folic acid in papaya can help convert homocysteine ​​into harmless substances in the body. Homocysteine ​​is a substance which, when attached to the walls of blood vessels can lead to heart disease and stroke. Papaya contains several unique protein-digesting enzymes such as papain and chymopapain. This enzyme has been shown to help treat inflammation and enhance the healing of burns. In addition, the antioxidant nutrients found in papaya, including vitamin C and beta-carotene, are also very good for reducing inflammation. This may explain why people with diseases worsened by inflammation, such as asthma, osteoarthritis, and rheumatoid arthritis, find that it reduced the severity of their condition when they get more nutrients. Benefits of papaya fruit which may already widely known and already proven itself, namely as facilitating bowel movement. Have you ever experienced a first childhood constipation then by your parents told to eat papaya? Papaya fruit is quite known as a laxative, which is a fruit that can aid the process of defecation. Because the papaya contains soluble fiber which helps the release of feces. Potassium plays a role in keeping the papaya healthy heart and blood vessels which can prevent heart disease and stroke. Did you know? Papaya juice and papaya fruit extract appeared to have antihiperlipidemik effect. 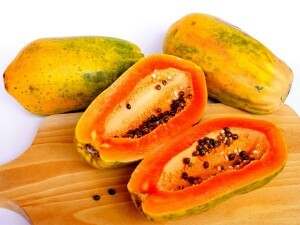 Through a preclinical trials published in Nig J. Nat.Prod and Med (2006) states that consume papaya juice and papaya fruit extract can lower plasma cholesterol and triglyceride levels because the content of the enzyme papain in pepaya.Pepaya also a good source of fiber, which has been shown to lower high cholesterol levels. Folic acid found in papaya is needed for the conversion of a substance called homocysteine ​​into benign amino acids such as cysteine ​​or methionine. If unconverted, homocysteine ​​can directly damage blood vessel walls and, if levels are too high, is considered a significant risk factor for heart attack or stroke. Nutrients in papaya have also been proven to help in the prevention of colon cancer. Papaya fiber is able to bind to cancer-causing toxins in the colon and keep them away from the gut cells healthy. In addition, folate, vitamin C, beta-carotene, and vitamin E have each been associated with a reduced risk of colon cancer this besar.Nutrisi provide synergistic protection for colon cells from free radical damage to their DNA. Increase the intake of nutrients by enjoying papaya is an excellent idea for individuals at risk of colon cancer. A combination of folic acid, vitamin C, beta-carotene, and vitamin E may lower the risk of colon cancer. These compounds provide synergistic protection against pit cells from free radical damage to the cells of the colon. Fiber is very beneficial for people with diabetes because it can lower blood sugar levels and prevent blood sugar spikes. A study concluded that patients with diabetes who consume fifty grams of fiber each day, helps lower glucose levels and insulin levels as much as ten percent as much as twelve percent. Benefits of papaya fruit which is not less important is to fight aging and maintain healthy skin and hair. The content of antioxidants, vitamins A, C and E contained in papaya counteract free radicals that cause various skin problems, such as blemishes, acne, wrinkles, and so on. Besides helping to moisturize the skin, these vitamins can also help restore the dull skin becomes brighter and fresher. The content of vitamin A also makes papaya good for your hair. Fruits that can treat the skin naturally can be viewed at the 7 Most Nutritious Fruits To Take Care Face Naturally. Papaya can be consumed directly or processed into other products. For example, meat young papaya fruit can be cooked as a vegetable base. Meanwhile, meat ripe papaya fruit can be used as a mixture of iced fruit, fruit cocktail, juice base material, to a salad mix. In general, this kind of treatment has no effect on reducing nutrient papaya. In addition to the fruit, papaya seeds can actually be consumed, though unusual. Part of papaya seeds is in fact beneficial to health. Papaya seeds have antibakterii effects that can fight bad bacteria such as Escherichia coli, Salmonella sp., And Staphylococcus sp. Causes of diarrhea. In addition, papaya seeds can be used to kill parasites in the digestive tract. Based on a study of children in Nigeria who have parasites in the digestive system, it was as much as 76.6% declared free of the parasites after seven days eating papaya seeds. Ensure consumed ripe papaya optimized so that the nutrients are consumed to a maximum. Durability papaya store about 14 days with the storage conditions of temperature 7 ~ 13 ° C and the humidity 90 ~ 95%. If papaya stored at temperatures below 12 ° C, a risk of chilling injury characterized by uneven ripening fruit and papaya smell and taste unpleasant. Meanwhile, if the papaya stored at room temperature conditions, this fruit only lasted 2 ~ 3 days. 0 Response to "9 Benefits of Papaya Fruit"